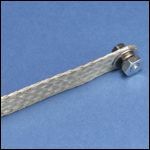 A Cable Runway Ground Strap bonds cable tray, wire mesh tray and cable runway components together and to the telecommunications grounding and bonding infrastructure (e.g., through cabinets and racks). This method offers a better electrical connection than wires with lugs. The industry’s usual solution is a #6 AWG stranded wire with a two-hole lug on each end. ERICO has gone one step further, in offering a gauge-equivalent tinned, electrolytic, woven copper braid with integral palms at each end with holes for attachment using 1/4” hardware. A Cable Runway Ground Strap bonds cable tray, wire mesh tray and cable runway components together and to the telecommunications grounding and bonding infrastructure.